The idea of sleeping on a plane can be your worst nightmare, especially when you have taken a long flight. You really cannot sleep due to congested legroom, people talking around you and some climbing over you to get access to the storage cabin. The screaming children and the sunlight coming from a few windows can make the situation even worse. If such issues trouble you on every flight that you take then trust me that you are not alone. However, you can do a number of things to minimize all the negative aspects which might allow you to have a nice and comfortable sleep in the flight. Wisely selecting your seat –The selection of your seat can be the most pivotal factor for your comfort in the flight. If you have the option of choosing the seat by yourself, then try to go for a window seat. Carry least possible carry-ons – If you board a plane with 2 piece carry-on then you probably have to place one under your feet which can be very tiresome. Therefore, make sure to go with one carry-on which could be placed in the overhead compartment. Avoid coffee or tea on the flight – It is typically important in the day time flight where caffeine going in your veins would deny you sleep. Just look for soft drinks and water while the drinks cart comes your way in the flight. Claiming the blankets and pillow in flight – The flights usually doesn’t have huge stocks of blankets and pillows in the plane. If you think that you would need a pillow or a blanket ,then make your claim as soon as you board the plane or otherwise it could be too late. Neck Pillow – A neck pillow can be a great utility to have in flight in order to get a comfortable sleep. You can buy one according to your comfort and packing it in your handbag wouldn’t be any trouble. Staying barefoot in the flight – People have mixed opinions about this thing. Some say that it is very comfortable and relaxing as your blood circulation in the feet is improved. It is good to remove your shoes but make sure you are wearing comfortable and weather friendly clean socks. Use of sleeping aid – You can take some sleeping drugs at your own risk. The drugs such as Melatonin and Dramamine are both over the counter drugs which you can consider for having a good comfortable sleep on the flight. Headphone with discretion – It has been tried and tested that soothing music in the flight can lull you to sleep. It is best to take the noise cancelling headphone on the flight, which will just cost you a few dollars. Seat reclining – The reclining seat feature can be considered as a last resort. 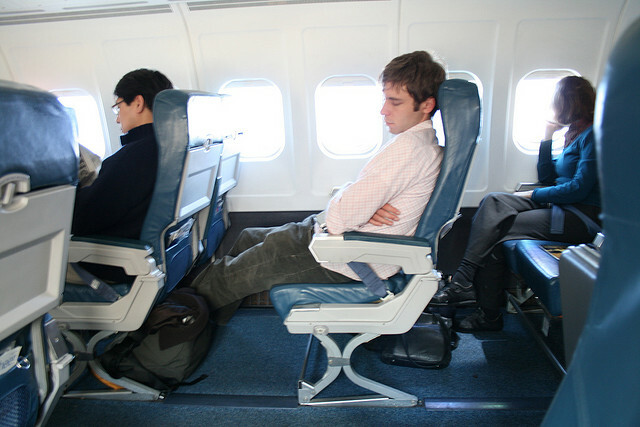 It is said, for the reason that the person sitting behind you might get congested if you recline fully. In order to be courteous with others, it is advised to recline the seat half way down. Notifying the flight attendant –If you are going to sleep, then you can make use of the sign cards given at the flight which alerts the flight attendant not to disturb you. Using eye mask – The sunlight coming from the windows, light in the cabin and the flashes of the TV screen can be very distractive to go for a sleep. In order to counter this issue, you can make use of an eye mask to enjoy a good sleep without any visual distraction. The wake up time – The worst part of sleeping in the plane is waking up. If you wake up at the last minute, then the panic might land you in trouble and your mood might not be that good too. So for this reason, it is highly advised to make use of your alarm clock or your cell phone to wake you up. It is advised to set the alarm 45 minutes before the expected arrival time.